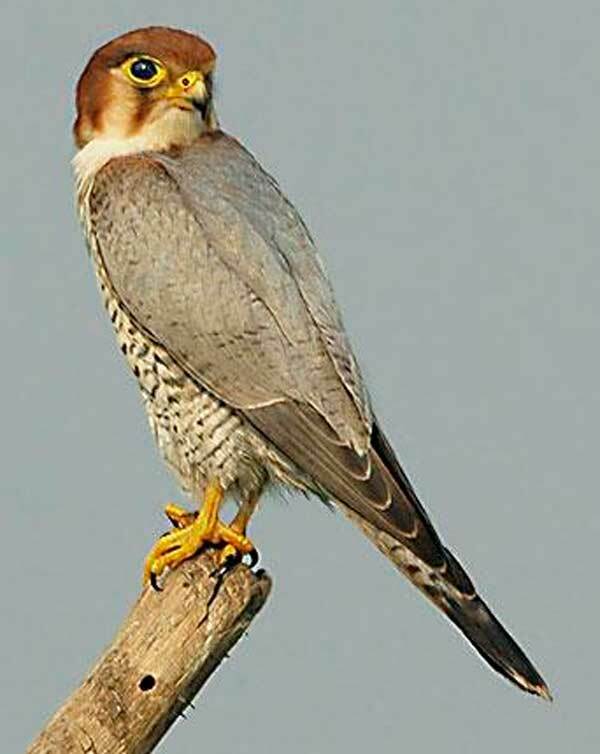 The Red-necked Falcon is a medium-sized, long-winged species with a bright rufous crown and nape. It is on average 30–36 cm in length with a wingspan of 85 cm. The sexes are similar except in size: males are smaller as females as is usual in falcons. Young birds are buff below with less extensive barring and duller upper plumage. West African males are known to weigh between 139 and 178 grams, while females are found between 190 and 305 grams. The particularly large African birds from south of the Zambezi River are often separated as subspecies Falco chicquera horsbrughi, but the size variation may be clinal and the latter subspecies not valid. The Asian nominate subspecies Falco chicquera chicquera has rufous moustachial stripes, lacks the buff breast band, and is less extensively barred than the African subspecies. The Red-necked Falcon is of unclear relationships. While it is sometimes allied with the Merlin or the African Hobby, this is most probably not correct. It might actually be distantly related to the Peregrine Falcon but much more study is needed to resolve this problem. In any case, the African and Indian forms are very distinct and have probably been separated for a long time; they might be considered distinct species. The Red-necked Falcon is found in semi-desert, savannah and other dry open country with some trees, but also riverine forest. It often perches hidden in the crown of a Borassus palm (Borassus aethiopium), and chases birds, bats and large insects with a fast dashing flight. It is most active at dawn and dusk, hunting below the tree canopy. It often hunts in pairs, sometimes utilizing a technique in which one of the pair flies low and flushes up small birds while the other follows higher up and seizes the prey as it rises from cover. This falcon reuses the old tree nests of corvids, or lays its 3-5 eggs in the debris in the crown of a palm tree.